Can you confirm these amateur observations of Tantilla cuniculator? 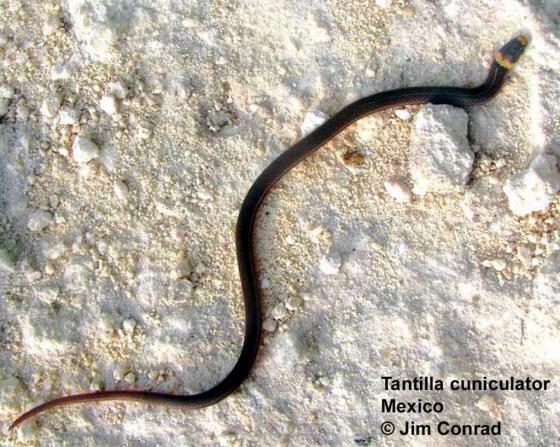 Type locality: Mexico, Yucatan, Merida. Diagnosis Diagnosis. Similar to Tantilla moesta, having seven supralabials, two postoculars, rostral scarcely visible from above, a broad frontal and a light, dark-bordered nuchal collar; differing from moesta in number of subcaudals (49 to 53), absence of pigment on ventral scales, presence of a dark lateral area sharply differentiated from a somewhat lighter dorsal color, snout light, and a small or large light spot behind eye [from SMITH 1939]. Etymology The name cuniculator is derived from “the Latin cuniculus, meaning ‘a rabbit or underground passage’ and by extension, a ‘burrow’ and –ator, meaning ‘of or characterized by,’ in reference to the semifossorial habits of this snake” (Wilson, 1985).